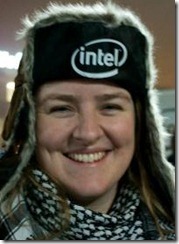 Aster Busse (Breeze) and Thijs Rieken (Biohazard) of clan KoF are also Intel Pack4DreamHack firsttimers. Let’s check how they like it! his: Well, Dreamhack is the largest LAN in the world, so it’s something you should do at least once in your lifetime if you’re a LAN enthusiast. Some of the people we usually meet on Duh-LANs like CampZone and The-Party are also involved with Intel Pack4Dreamhack, so we decided to try it for ourselves. hers: The bus-ride was very long… And i was dreading to go on a bus filled with smelly, loud nerds, but it was bare-able thanks to the awesome goodies; earplugs for the noise and 1337-talk, sleeping mask for the flashy laptops and such and a blanket for the nordic cold. Only thing what was missing was some nose-plugs for the smell :p.
hers: Omg it’s so big (that’s what I said). his: The first toilet visit was heaven, but that was clearly because it was still early and the event had just opened. I have to say, I haven’t seen a toilet without paper yet, but there are constant queues at the mens, unless you just need to pee. hers: Wow! Finally no queues!! It’s heaven to be a girl at these things. Which is a real change, because usually the queues are murder for girls at other types of events. his: I’m not really that much of a gamer. At the moment I have the beta for Star Wars: The Old Republic under Alt-tab, and I’ve played a couple of League of Legends matches and some Magicka. hers: Lots of League of Legends. It’s my main game at the moment… I did some Skyrim and we played some Magicka with our friends from clan BAF. Clan BAF and KoF are camping together on CampZone. The Star Wars beta started to get boring after an hour. 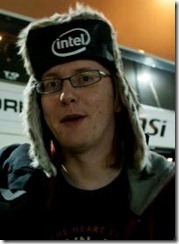 I finally started to play StarCraft II, and I do quite like it, hopefully Sinterklaas will bring me my own account :-). his: Can’t understand a thing. Written Swedish is one thing, but I can’t make out anything anyone says here. hers: Everything sounds like the muppet Swedish Chef xD. his: Mostly loud noise and crowds on my way to the coffee-kiosk. hers: I was hoping for a DOTA2 stand, but i can’t find it :-(. his: Mostly the Duh-related people and CampZone visitors :-). Jeroen, Steph, the BAF delegation (Klaas and Youri) and a LOT of common faces I constantly forget the names of. hers: ^ this… Though I do remember nicknames quite easy. his: Well, we’re getting a bit older now, and that means we actually like comfort. So we had a caravan this year on CampZone instead of a sleeping tent, and we rented a cabin for DreamHack thanks to Rob’s E-mail… Maybe a hotel room at the next The-Party? hers: So happy that Thijs booked us a cabin nearby. No sleeping in the big hall for us. Just the four of us from Kof+BAF. So I slept like a baby, and jumped in the shower right after waking up.